In my short time as a knitter, I have frequently noticed that I can see a design and think (if I am honest with myself) “Now why would anyone want to knit that?” I put the item out of my head and keep going. Then later, I go back to the item and wonder what I ever disliked about it. The biggest example of this that I can think of: any object that fell into the entire category of cowls. When I started knitting, I thought they were the silliest thing in the world. After all, who wants to knit part of a turtleneck sweater? Funnily, years later, I haven’t a clue what I was on about. I knit a few early on for friends and remember thinking, “These are great! You don’t have all that fabric under the front of your coat. They can’t fall off and get lost…always a bonus. They take up less yarn and are faster to knit than scarves. And they are in the round, which generally means less purling.” As someone who is highly purl-averse, this is not something to be taken lightly. And best of all, they take less than 100 yards of worsted weight yarn. So now I am stashdiving, as I know I have a couple of small skeins of worsted weight yarn that I remember thinking, “These are so tiny…whatever will I do with them?” Perhaps this is the answer. 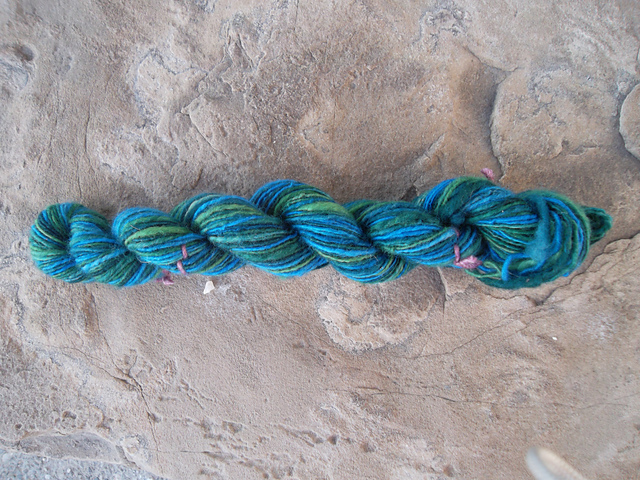 I also found a small 50 g skein of single ply worsted that I handspun on my spindle. After I soaked it and skeined it, I recall thinking “The yardage of this skein is so small. Pity it’s never going to actually be anything”. This entry was posted in Uncategorized and tagged calorimetry, knitting, knitty, patterns by Rayna. Bookmark the permalink.